A new peak time TV series from the creator of smash hit show Downton Abbey airing tonight at 9pm on ITV unveils a secret side to England’s greatest Elizabethan house. ‘Great Houses’ with Julian Fellowes is a compelling two-part factual series that takes viewers on a journey to discover the real people behind two of Britain’s most incredible houses, Lincolnshire’s Burghley House and Goodwood House in West Sussex. The man who has penned the most successful period dramas of recent years turns his attention to the real life stories and secrets of not only those that owned these grand houses, but also those that served in them Burghley, which sits on the edge of the picturesque Georgian stone town of Stamford, provides a few historic surprises – including the shocking murder of a cook. For the last four centuries Burghley has wowed visitors, whether Elizabethan royalty, locals enjoying the parkland or tourists from across the globe. Built for Elizabeth I’s chief minister William Cecil, Lord Burghley, it now offers a packed family day out with a combined ticket giving access to the stunning history and architecture of the House, and its huge collection of treasures, plus two gardens, including the Tudor-inspired Gardens of Surprise. The new TV show discovers some new stories from its past too. 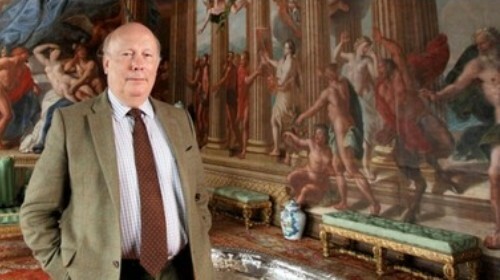 ‘We so enjoyed working with Julian Fellowes on the making of this programme. His extraordinary knowledge of life upstairs and downstairs in the English country house was invaluable in the discoveries he made about the history of Burghley. Understanding more about those who have lived and worked here has been fascinating and it really brings the story of the house to life,“ said ‘ Miranda Rock, House Director. Burghley House opens for its 2013 season on Saturday 16th March, but although the house might have closed, Burghley’s popular Orangery Restaurant continues to serve up foodie treats this winter from 10am until 4pm Wednesday to Sunday. Visitors are welcome to come and visit the Orangery Restaurant and take a walk through Burghley’s sweeping parkland, free of charge throughout the year. Burghley’s Sculpture Garden is also open free of charge from 11am to 4pm daily through until Friday 15th March 2013 (Garden may be closed for essential maintenance work).